The Guardian wondered why there’s not a bigger outcry over the GCHQ/NSA public spying revelations. A quick search shows that news sites across the world are talking about it. I would like to make clear that we (royal if need be) are not at all happy or prepared to accept the situation. I admire The Guardian for speaking out and am delighted that GCHQ will be taken to the court of European rights and hope the US and other affected countries does likewise. I think this calls for some questions about the accountability and purpose of secret services. Australia’s Green Party has some interesting ideas and also defines what national security should really be about. I ask: how can you be legitimate or moral if your actions compromise your supposed reason for being – namely, to keep us safe and free in a country run by the people in a transparent way, we lose basic rights in all the above? It’s a paradox that cannot be. The title comes from the tagline of British MI5 drama, Spooks. I have been researching for my next post and I wanted to get it right. I have views on Poppy Day which passed before I had consolidated them. I had read various stories relating to war and the secret service, but also felt frankly afraid to voice them. You will notice by now that I write against harmful systems and for justice and liberty. I am against control and propaganda. What I have to say this time particularly concerns those, linked by my unlikely sounding title. 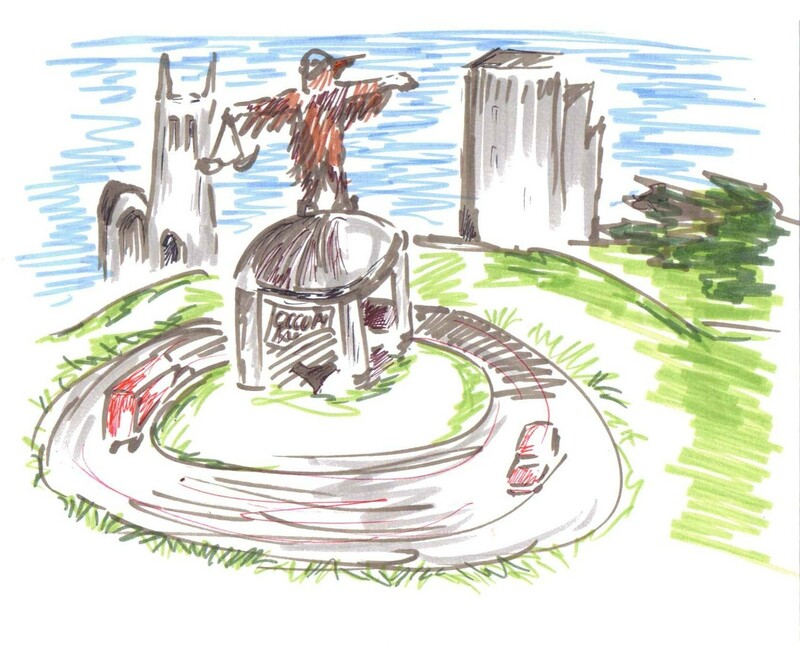 ‘Justice is restored’ refers to a missing statue. In that same town, something else that’s a known local feature has disappeared – the wild chickens who refused to move when their home became a roundabout on a busy bypass. I saw a local news headline that ‘justice has been restored’, but then I wondered about that in larger terms. Each time I pick up a newspaper, I read something else which makes me angry because justice is being evaded or distorted. The people meant to protect justice curtail or suspend it for the citizens they are mean to be servants of. Policing of riots and protests; secret courts; laws coming in by a government we didn’t choose to make it ever harder for the public because of actions by rich people who are still rich. I suspect whatever country my readers are from, you can relate to this in some way. I read Robert Harris’ wartime code breaking novel Enigma and again felt anger at the secret service. It may be fiction, but it is based on some truth. The public are recruited by a crossword competition; in the book Hester is told to sign the Official Secrets Act and stick to it or the gun on the desk beside the form will be used on her. She has not yet volunteered nor understands how her cryptic puzzle solving skills will be used or what threat she may be under. Tom is also recruited in an underhand way that leaves him little choice. He is threatened by security service officers who appear in his home to scare him off something he accidentally discovers. It struck me that in the name of protecting democracy, secret services go against the very values that the countries they serve are built on: openness, honesty, trust; protecting the public so that we can go about our lives freely, without fear. I am always appalled when I read of how much control the military and government exerted in the war. What system can be worth fighting for when refusing means that your own side turns on you? Why does an army find the resources to harm conscientious objectors from its own people? In the 1970s TV series, Wonder Woman turns a Nazi through demonstrating that the German army did not care for its own and were happy to kill them. Wonder Woman implies that hers is the better side for its contrasting ethics and treatment. I did some wondering of my own. After being shocked again at the Katyn forest massacre of Polish prisoners of war and how that the British knew but pretended not to, I decided to watch the Polish 2010 film Katyn to see what they had to say on it. I was horrified at how anyone could shoot thousands of men and dump them in a mass grave, as I was to see a country’s own police demand entry and haul its own people out of their homes to concentration camps in Sarah’s Key. Note none of this was Nazi doing. Nationalism frightens me when it threatens to make us hate other people and to incite acts of cruelty against them. It is one thing to be proud and loyal of one’s country, another to use that to create otherness instead of brotherness (girls included). The world is our neighbour, not just those with the same passport. I am struck by the propaganda about war in my own country and am wary of how public statements may be used to influence peer pressure and curtail dissent. The head of Britain’s MI6 gave a speech about how secrecy is necessary for our country and the rest of the world to go about safely. Yet I don’t feel safe – not because I especially fear terrorism, but the shadowy world of government endorsed crime fighters. I am appalled that the tax office can use spying and that financial safety is a reason to for secret intelligence – along with that much used slippery phrase ‘threat to national security’. To complete my trilogy, I watched Fair Game, from the memoir of Valerie Plame Wilson, the former CIA agent (starring Naomi Watts and Sean Penn). She was deliberately outed after her ex-diplomat husband Joe spoke out that he found no weapons of mass destruction and therefore the basis of the 2004 Iraq war was spurious. They fought a long battle against the CIA and the US government. I am unsure exactly where she stands on some issues – in her DVD commentary she does not comment on the question: ‘have you killed people’ or that the CIA bound and beat recruits as part of a training exercise to find their breaking point. Or that she recruited people by manipulation and stealth and that they were not protected by the agency but killed. I did like her line: security should not stop freedom. If people fear police and military and security agencies more than terrorism; if liberty is curtailed in the name of keeping us safe, then security ‘services’ are no longer morally or operationally justified as it is acting against their very raison d’être. I read that there have been calls to abolish some secret services. I wonder if any such an agency is really necessary or the best way to combat these problems. A service built on secrecy and deception is not sound and clashes with the morals and codes of many faiths and ideologies. It involves falsely presenting oneself not only to the adversaries but to one’s own loved ones, meaning isolation for employees as well as anyone who is recruited or who accidentally has a brush with one. Just as a faith and its true believers are more than and separate to the official church, a nation is not its government, its laws or its leaders and figureheads. These organisations do not get to say what it is we are defending or believing in. A national interest is not something than an agency or minister defines. You can’t have equal opps laws and boast of your diversity on one hand whilst enforcing conformity on another. I am glad of the attempts by the intelligence agencies to be accountable in my country and of the laws which govern them. But then we don’t chose or scrutinise the ministers that call into account or make the laws. Democracy means ‘rule by the people’ but many of us in those kinds of societies don’t feel we get to do the choosing and have the input that so titled society ought. The ‘C’ of MI6 speech speaks of enjoying public confidence – which it needs. But stories about Guantanamo Bay, like those on the Canadian Homes Not Bombs site, and Britain’s foreign secretary’s ideas undermine that. I believe that is just part of what many of us are speaking out against. (I have also seen Friday’s news about US police and Occupy protestors). If secret services fight threats to economic stability that harm the public, I consider they ought to be busy – at all those who caused the recession and its effects. There’s more damage done there by our own supposed legit institutions than terrorists. And lastly to those chickens. What do they represent? Freedom despite control. Not being part of the regime. A reminder of nature and how we try to dominate it. A Unitarian hymn at first shocked me by its triteness – but there’s something affirming about ‘the grass that breaks through the concrete’ and the chickens that roost despite the tarmac and concrete built round them. I see those chickens as a symbol of a simpler, more natural life, a refusal to let human bureaucratic control spoil their lives. Their absence therefore concerns me. After calls to remove them, they were poisoned and attacked and then were rehoused reluctantly by the man who had been feeding them. I know what I infer from that. You can even buy a board game of it!